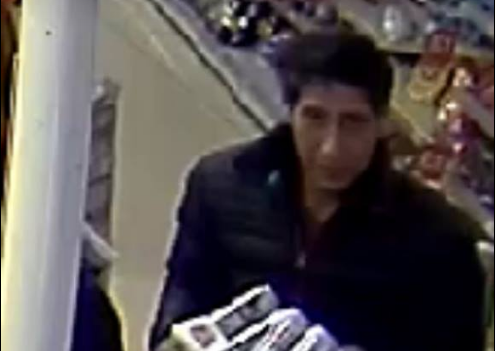 LONDON — A U.K. police force has received thousands of comedy responses after posting an image from a security camera showing a man strongly resembling "Friends" character Ross Geller stealing beer from a restaurant. Police in Blackpool, in northern England, shared the photo of the man on Tuesday, which shows the David Schwimmer lookalike clutching a crate of beer. Blackpool Police shared the image on their Facebook page in a post, which was later removed, and were inundated with comedy responses inspired by some of the iconic lines from the 90s TV program. "It hasn't been his day, his week, his month or even his beer...," joked one contributor. "How did he manage to take that unnoticed?" asked Tommy Dunsmuir. "Was someone on a break?" The police department seemed to enjoy the jokes from Facebook users, taking the time to clear the name of the actor. "Thank you to everyone for your speedy responses," they said. "We have investigated this matter thoroughly and have confirmed that David Schwimmer was in America on this date." "We're so sorry it has to be this way." Over 100,000 users have joined in, with a number of them referencing the show's iconic theme song. Schwimmer himself chimed in with a tweet hashtagged #itwasntme. Police forces in Scotland also joined in the fun. Police in Dumfries and Galloway shared the Facebook post, and warned members of the public to stay away. "He is known to have studied Karate and we believe he has mastered the art of Unagi, the state of total awareness," they said, in reference to a season 6 episode of the show in which Ross confuses unagi (a Japanese eel) with zanshin (a term used in Japanese martial arts). A witness to one of the Easter Sunday bombings in Sri Lanka says the government has blocked Facebook, Instagram and WhatsApp, leaving people confused in the chaos. Asela Waidyalankara tells CBSN what he heard when a blast went off in Dehiwala.